Mortgage Market guide: Retail Sales Drop. Wages Too. Last Week in Review: Retails Sales didn’t register in July, while wholesale inflation remains tame. Forecast for the Week: Housing headlines and consumer inflation will be the highlights of the week. View: Make social media management easier with these four tips. “Don’t bring me down.” Electric Light Orchestra. 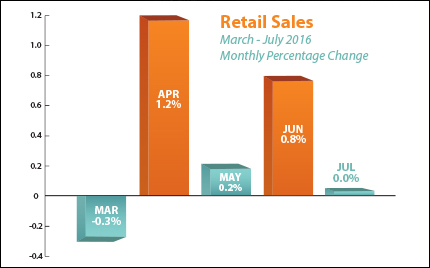 After big gains in June, consumers didn’t move the needle on Retail Sales in July. Economists were looking for a 0.4 percent rise, rather than the zero percent change reported. Lower sales for gasoline, sporting goods, food and beverages, and building materials were a drag on the data. However, there was one bright spot: Retail Sales were up 2.3 percent from a year ago. Also of note, the Bureau of Labor Statistics reported real hourly compensation decreased 0.4 percent in the first quarter of 2016 rather than the previously published increase of 4.2 percent. Compensation also fell another 1.4 percent in the second quarter, from April to June. These revisions followed an update to the National Income and Product Accounts released by the Bureau of Economic Analysis of the U.S. Department of Commerce on July 29, 2016 and don’t bode well for the average pocketbook. Consumers may further tighten the purse strings as the reality of wages catches up to them. Wholesale inflation remained tame in July, as the Producer Price Index (PPI) saw a 0.4 percent decline. The Core PPI, which strips out volatile food and energy readings, also fell 0.3 percent. Inflation reduces the value of fixed investments, like Mortgage Bonds. This means tame inflation tends to be good news for home loan rates, since they are tied to Mortgage Bonds. For those looking to invest in a home right now, home loan rates are still on their side. Rates remain in historically low territory. Housing headlines will be a highlight of the week. Regional manufacturing data from the Empire State Index will be released Monday followed by the Philadelphia Fed Index Thursday. The housing sector will be highlighted in the Housing Market Index Monday as well as Building Permits and Housing Starts Tuesday. Inflation in the form of the Consumer Price Index will be reported on Tuesday. The Federal Open Market Committee minutes from July will be released Wednesday. As usual, weekly Initial Jobless Claims will be reported Thursday. As you can see in the chart below, Mortgage Bonds have held relatively steady but received a slight bump following the weak Retail Sales report. Home loan rates remain in historically low territory. Get organized. Before you post anything, set yourself up for success by making sure you have a plan to post consistently. This handy content calendar template by HubSpot and Buffer is free in exchange for your name and email. Use it to plan out when you will post industry news, how-to tips, testimonials and time-sensitive items around holidays or key deadlines (like tax time). Get automated. Setting aside a block of time to gather all your posts, then scheduling them to post automatically throughout the week is simple with time-saving platform management apps like Buffer or Hootsuite. Get curated. Constantly posting ads for your business is a no-no. When you identify topics of interest for your audience by others, you might want to file this content away for future use (like scheduling it for the following week). Organize and save content you come across in your web browser, email or using Pocket, which is integrated with more than 1,500 apps. Get help. If managing your social media accounts begins to encroach on your income-producing sales activities, consider handing it off to an existing employee, hiring an intern from a local college (making sure they get to know your business and audience), or looking into freelance sites like Fiverr or Upwork for professional help (check ratings and testimonials thoroughly!). Just a few hours a week can help you manage your content calendar, identify content and schedule meaningful, engaging posts consistently. Social media provides lots of new and repeat business opportunities, and these tips will help make staying on top of your strategy easier than ever.